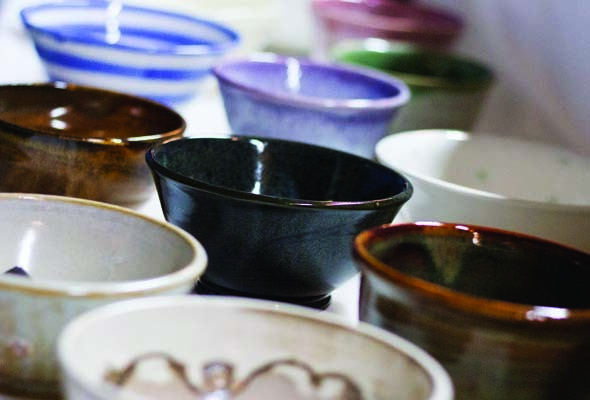 Empty bowls aims to fight hunger and address food insecurity. $25 for a hand-made ceramic bowl with a serving of soup and bread. The event is 11am – 2pm at 18 Cleve Road, in Hampstead. Children $5 (under 12 meal only). Proceeds to Chanukah Food Baskets. Goodman Cancer Research Centre offers two lectures on “A reason to hope: understanding and managing cancer.” Sessions include a testimonial from a patient. Q & A follows. Sat., 10am-3pm, at Summerlea United Church, 225-50th Ave, Lachine 30 artisans will display their crafts, baking, and books at bargain prices! Quiche with soup, salad & dessert available 11am & 2pm for $10. 514-634-2651. Royal Canadian Legion, Branch 212, will hold a dart tournament to raise funds for cancer research Saturday. Registration: 10am to noon. Tournament begins at 12:30pm. $10. Door prizes and raffles. Cash prizes for the winners. All donations appreciated. Tax receipt available. 514-772-2646. 2-4pm at Le Cambridge, 340 Hymus Blvd. in Pointe-Claire, shape, create a clay art tile to celebrate spring, suited for all levels of dexterity. Coffee & cookies. $10. Space is limited. 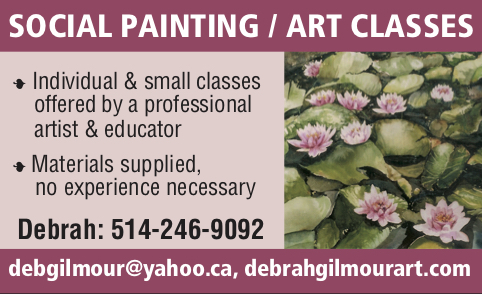 514-587-6533 or kbennett@bayshore.ca. Proceeds to Lakeshore General Hospital Foundation and will be matched at 50% by Bayshore Foundation. An exhibition of the work of the late artist, R. Guy Pilon, will be held Tuesday, 6 – 8pm at Georges Laoun, Optician, 1396 Sherbrooke W., Prof. Norman Cornett will facilitate with his interpretations and encouragement of audience reactions. Dr. Mounir Samy of the Montreal Children’s Hospital will comment on the intersection of psychiatry, psychoanalysis, and art. Wine reception follows. Meetings Tuesdays, 1:30-2:30pm at the Unitarian Church at 5035 de Maisonneuve W. Non-members $10. April 19: G. Scott MacLeod, visual artist; April 30: Deena Dlusy-Apel, artist. Swing into Spring with dinner and dancing Fri., May 10, 5 – 10:30pm. Royal Canadian Legion Ste Anne de Bellevue, 28 Sainte Anne St. To register: Beaconsfield-club55plus.ca or call 514-630-3961 or 514-695-1449. For the CONNECT People to a Digital Lifestyle project, Lynn Bennett, Certified Financial Planner, and Liz Perrin, computer instructor, demonstrate how to file an income tax return online. The workshop includes an overview of the new provisions of 2018 federal and provincial income tax laws for seniors — changes from last year. Participants welcome to bring their own devices. Registration required: richard@atwaterlibrary.ca or call 514-935-7344 # 206. Elaine Kalman Naves shares the story of how she became the author of two family memoirs. You, Me, and Memoir: the Art and Craft of Memoir Writing: Elaine Kalman Naves guides you in writing your personal story. No registration necessary. A intergenerational artwork/art walk in Shaughnessy Village, starting and ending at the Atwater Library called Promenade parlante: Episodes in a Changing Neighbourhood. Alzheimer’s Café presents Jessica Seidman, Coordinator of Clinical Services with the Alzheimer Society of Mtl, on Grief: The Obscure Companion of Dementia. Refreshments. Jaimie Yue, dietitian-nutritionist, shares recipes and tips to make healthy, affordable meals. Historian Gail Cuthbert Brandt discusses her book Through the Mill: Girls and Women in the Quebec Cotton Textile Industry, 1881-1951. Woodstock 1969: Music, Legends, and Legacy celebrating Woodstock’s 50th anniversary. Concordia Prof. Craig Morrison discusses the festival’s historical and cultural context, with images and music. All events are free. Donations welcome. 1200 Atwater Ave. at Ste-Catherine. 514-935-7344.